Never mind melancholy singing frogs and cosmic peas – today we turn our color wheel from green to blue and examine an unusual class of stars, and recent evidence that may settle a long-standing debate as to their origin. So-called “blue stragglers” have been confounding astronomers ever since Allan Sandage first noted their existence as an aside in a 1953 paper. Although they are relatively rare stars, a few of them have been found in most older star clusters, and recently some have been observed singly outside of clusters as well. Blue stragglers were first detected in star clusters, where they clearly stand out because they occupy a region of the Hertzsprung-Russell (H-R) diagram (a luminosity vs. temperature plot of stars) that should be completely empty. Unlike dark energy, galaxy formation, and government funding for science and the arts, astronomers think they understand stars fairly well. A star’s age and initial mass uniquely determine its luminosity and temperature: stars of a given mass on the main sequence – the primary phase of a star’s life, in which it fuses hydrogen in its core – have a more or less fixed position on an H-R diagram. An ensemble of main sequence stars of various masses populates a distinct diagonal line on this diagram. When a star exhausts its usable hydrogen, its structure changes drastically and it rapidly becomes brighter and slightly cooler (moving up and to the right on the H-R diagram), entering the shorter-lived red giant phase. A star’s mass also determines its main sequence lifetime: bigger stars burn through their supply of hydrogen much, much faster than smaller stars. The range in lifetimes is huge, from under a million years for the most massive stars to much longer than the age of the Universe for stars less than half the mass of our Sun. In a star cluster, all members formed at about the same time, and so we see a clear position on a cluster H-R diagram called the “turnoff” where stars with main sequence lifetimes equal to the age of the cluster are just now moving into the red giant phase. Stars with higher mass have already evolved, leaving the upper region of the main sequence unpopulated — that is, except for a few interlopers affectionately dubbed “blue stragglers.” They are brighter and bluer (and thus more massive) than the stars at the turnoff and by all rights should have already evolved off the main sequence long ago. 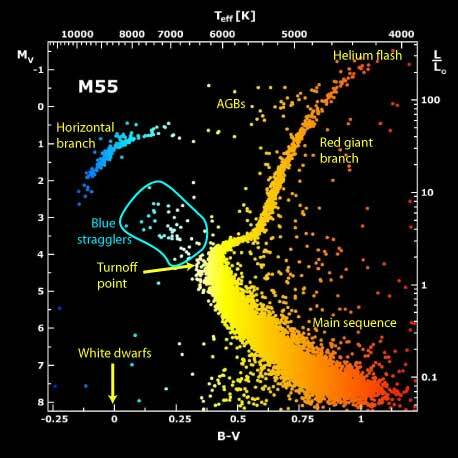 The Hertzprung-Russell (H-R) diagram of globular cluster M55, plotting luminosity (visual magnitude MV) versus temperature (color B-V). This particular figure highlights the unusual position of blue stragglers just beyond the turnoff, which should have already evolved off the main sequence long ago. What is the physical reason for these interlopers’ unusually high brightness and temperatures? The simplest explanations for how blue stragglers could show up where we see them on H-R diagrams were explored – and dismissed — first. The most obvious possibilities are that either the stars somehow formed later than the other stars in the cluster, or that they aren’t actually in the cluster at all. However, we see blue stragglers even in the oldest star clusters (globular cluster), and these ancient structures exhausted their gas reservoirs long ago, stifling their ability to form stars recently enough to explain blue straggler masses. In addition, blue stragglers are seen even in the centers of star clusters, and it would be practically impossible for interlopers to get there. The issue was clearly more subtle. Eventually, two primary theories emerged: (1) two less massive stars merged at some point during their lifetimes, leading to a single more massive star; or, (2) blue stragglers are in binary systems and accreted mass from an evolved companion. A third possibility was more recently added: (3) they may have formed in hierarchical triple systems. In each of these scenarios the blue straggler gained mass recently, and thus spent much of its time on the main sequence evolving at the rate given by its initial mass, effectively giving it an extended lifetime and explaining its unusual position on the H-R diagram. The idea that stellar interactions were involved in the evolution of blue stragglers gained observational support as well: most (about 75%) blue stragglers are observed to be in binary systems, and they tend to be preferentially located in regions of clusters where interactions are most frequent. However, all the proposed mechanisms involve stellar interactions, and the debate over which was correct continued in a series of studies over the past two decades with no truly conclusive evidence supporting one formation theory over the others. In this paper, authors Geller and Mathieu use a combination of observations, modeling, statistics, and N-body simulation to study blue straggler binaries in open cluster NGC 188, focusing in particular on the 12 systems (of 16 total observed) that have long (about 1000 day) periods. Binary systems are incredible stellar laboratories: by analyzing spectra, one can obtain orbital solutions that lead to either direct masses or mass functions of the constituent stars. In this study, the latter is the case, as the companion of the blue straggler is unresolved; the authors then use a statistical algorithm to turn mass functions into actual companion masses. The result is a narrow distribution peaked at just above half a solar mass. In the mass transfer scenario, the blue straggler will have accreted a large amount of gas from a “puffed-up” evolved companion (such as a red giant), which will then quickly lose its outer layers and shrink down to a white dwarf, the final state for most stars (such as our Sun). If this mechanism explains blue stragglers, we would thus expect them to be in binary systems with white dwarfs, and in fact a particular mass transfer theory known as “Case C” predicts that such white dwarf companions will have masses of 0.5-0.6 M¤ and orbits of about 1000 days, in excellent agreement with the observational results. (The authors also perform a Kolmogorov-Smirnoff (K-S) test to quantitatively establish the mass distribution agreement). If all the companions are indeed white dwarfs, they would be too dim to be observed, which is again consistent with the observations. Mass distribution of companions in blue straggler binaries (with periods of order 1000 days) in NGC 188 (shaded histogram), compared with a normal stellar initial mass function<link> (IMF; dotted line) and tertiary mass distribution (hatched histogram). The observed distribution is sharply peaked near 0.55 Msun, which is the expected mass of a white dwarf from Case C mass transfer theory. To quantitatively distinguish between formation mechanisms, Geller and Mathieu implemented a sophisticated N-body code that simulates the evolution of NGC 188 and produces blue straggler binaries through both collisions and mass transfer, then compared the results with their observations. The conclusion is striking: the companion mass distribution for collision-induced blue stragglers is sharply peaked at just over 1 M¤ , with mostly main sequence stars as companions. In contrast, the mass transfer scenario predicts that ALL of the blue straggler companions are white dwarfs with an average mass of 0.58 M¤ – incredibly close to the peak of the observed mass distribution. In addition, the authors’ simulations show that collisionally-formed binaries have more eccentric orbits and longer periods than both the simulated mass transfer systems and the observed stars (mass transfer is expected to tidally circularize binary orbits). So, the jury may finally be in, and it would seem that the collisional explanation for blue stragglers is getting the death sentence, at least as the main formation mechanism. However, the third, more recently theorized scenario – hierarchical triples – is also discussed briefly in this paper. 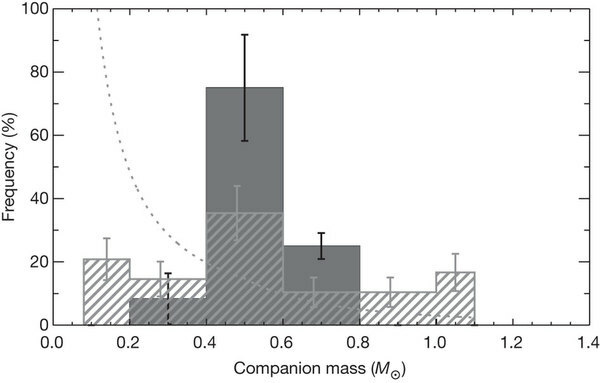 The mass distribution of such a system would be nearly constant across the range of 0.1-1 M¤ – significantly different from what was observed in NGC 188. This distribution also implies that some of the companions should be bright enough to be seen, and in this study, no companions were detected. However, the authors are careful not to rule out the triple scenario entirely in this work, instead highlighting their upcoming observational campaign to directly look for possible white dwarf companions in blue straggler systems using the Hubble Space Telescope. If they find them, the great caper of blue straggler formation could be settled once and for all, allowing us to turn our attention to other unfathomable mysteries such as green peas, dark energy, and politics. So while it may still not be all that easy being green (sorry Kermit), it might have just gotten a lot easier being blue. This was a great concise and easily understandable summary for an undergraduate! Thank you and keep it up!